These changes will likely be accelerated by Barack Obama’s repeal (in his last week in power) of the US policy that gave Cuban migrants favoured immigration status – both by eliminating an escape route for dissatisfied citizens and by reducing potential future remittances. Now that Donald Trump is in charge of the White House, it is a good time to highlight an old fact: in Cuba, hostility from the United Stated has long been the rule rather than the exception – even before the revolution of 1959. Yet at present, as in other moments, the internal factors shaping Cuban socialism deserve equal, if not more, attention than the external factors in order to understand how and why the Cuban polity has changed. In the short term, term limits mean that Raúl Castro’s presidency will end in February 2018, which he has confirmed. In the long term, that raised questions on the post-Castro era. To be sure, in 2013 Miguel Díaz-Canel, a Communist Party insider, was promoted to first vice president of the Council of State – the first time ever that a revolutionary veteran did not hold that position. Technically, according to the Cuban constitution, if the president dies, the first vice-president takes over. This is a clumsy engagement with the market, treating it as an alien from outer space. And it epitomises the current ideological hardships of the Cuban regime. Still, Raúl Castro has overseen the largest expansion of non-state socioeconomic activity in socialist Cuba’s 50-year history. From 2008 to 2014, more than 1.58 million hectares of idle land has been transferred into private hands. That’s nearly a quarter of Cuba’s 6.2 million hectares of agricultural land, roughly on par with the proportion of state-owned land (30 per cent). Cuba’s next generation of leaders – expected to take over in 2018 – will not enjoy the same unquestionable legitimacy as its founding fathers, much less that of Fidel Castro. So the inevitable passing of the revolutionaries still in power today, most of whom are in their eighties, makes the already difficult process of revamping the regime even tougher. Raúl Castro’s challenge over the past decade has thus been not only to make his presidency stand on solid ground, but also to make sure that such a ground endures after he leaves. The question of economic performance was clearly central to that task. 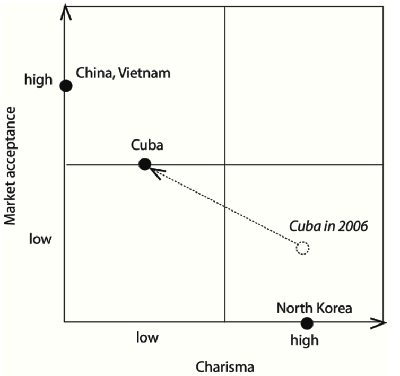 Raúl saw market socialism as a way to strengthen Cuba’s economy without abandoning its Castro-era ideals. The revolutionary veterans’ interest in seeing the system they built survive is unsurprising, and it explains their rejection of any capitalist encroachments. But it remains to be seen how long – and if – this ideological limit will survive them. The resumption of US hostility from the Trump administration may embolden communist hardliners in Cuba. But the return to orthodox Soviet economics is unlikely – especially when Cubans can no longer count on cheap oil coming from Venezuela nor with their privileged immigration status in the United States. More than ever, economic performance is a matter of state security. But the difference between ‘medium’ market acceptance and ‘high’ market acceptance is a substantial one. The latter presupposes a comeback of the bourgeoisie – the social class of owners of the means of production, expropriated by Castro’s revolution – and thus far this key ideological limit remains strong in Cuba. Since the Soviet Union’s collapse in 1991, many have assumed that the fall of communist Cuba is a matter of when not if. Only by abandoning the focus on ‘the fall’ and understanding how communist rule has survived in Cuba we can grasp that Cuba has already changed mightily.